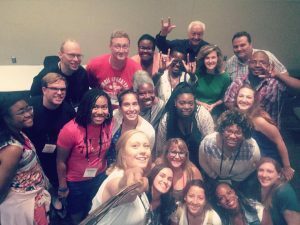 My name is Katie, and I recently attended the Reach 2016 Summit Conference in St. Louis, Missouri. Boy oh boy it was hot; the weather AND the lessons. I was grateful to go even if it meant I had to take a red eye flight at midnight. I was so happy to see many of my friends at the conference and to make some new friends. One of my new friends is Brittany Torres. We had a blast as she showed me around St. Louis with her “city skills”. It was great meeting our new Deaf brother in Christ, Forrest, along with so many other awesome hearing disciples. At the Deaf track, as we began our time together, we sat in a large circle. The circle kept growing as more people joined us throughout the session. We opened up by introducing ourselves and I found that most of the attendees were hearing with a minimal understanding of ALS (American Sign Language). I really enjoyed getting to know the large number of hearing people who attended the Deaf Track. When I talked with them I found that many of them were excited and curious about the Deaf community. A handful of hearing married couples shared that they felt called by God to love and invest in the Deaf ministry and the Deaf community as a whole. I met a few girls who had taken as many years of ASL as possible at their high school or college. This was all very encouraging! There were a few hearing people who expressed some uncertainty in how to approach Deaf and Hard of Hearing people. I wanted them to feel comfortable and confident as they approached our Deaf brothers and sisters so I thought of this analogy/comparison. When a hearing person meets a Deaf person they might be nervous thinking, “This is the first Deaf person I’ve ever met”. The Deaf person is thinking, “This is the 1 millionth hearing person I’ve ever met”! People laughed and there was a collective sigh of understanding. I appreciate the help of the volunteer interpreters and other seasoned disciple interpreters as I was able to sit back and have a break from interpreting. I did make one exception and volunteered for the song Men Who Dream (I love interpreting this song!). Orlando, Florida will be hosted the World Discipleship Summit in 2020. What an impactful time that will be! Let us pray together that many Deaf people from around the world will be able to attend. Fun Fact/Helpful Hint: If you saved 10 dollars each month starting this month, August 2016, you will have just under $500 dollars or you can save $30 each month and you will have just shy of $1,500 for the Summit. We can do this! Thank you God for letting us share such a great time together! Hi Katie! Reading this was so encouraging. I attended Reach and it definitely helped renew my relationship with God. I’ve been wanting to meet some of my brothers and sisters in the deaf ministry.I look forward to making sure I reach out at the next conference. Thank you for sharing your experience and tips for saving toward the next conference.